NETWORK FINALS: OLYMPICS coverage gained 0.1 in final numbers to 7.9. In addition, the entire ABC line-up was down: the AMERICA’S FUNNIEST HOME VIDEOS rerun by 0.3, and each of CELEBRITY FAMILY FEUD, THE $100,000 PYRAMID and MATCH GAME by 0.1. CABLE HIGHLIGHTS: Starz’s POWER continued to lead Sunday cable, up 0.07 to 0.85, and SURVIVOR’S REMORSE was up 0.11 to 0.36. A preview of THE WALKING DEAD Season 7, which won’t start until fall, drew 0.63, with a new episode of GEEKING OUT afterward at 0.19. On HBO, BALLERS gained 0.03 to 0.57, and THE NIGHT OF was right behind it, up 0.07 to 0.54, while VICE PRINCIPALS added 0.06 to 0.39, and LAST WEEK TONIGHT ticked down to 0.38. Adult Swim’s SQUIDBILLIES gained a tick to 0.55, and BRAD NEELY’S HARG NALLIN lost a hundredth to 0.46. Disney Channel’s KC UNDERCOVER hit the Top 10 at 0.51, with lead-out BIZAARDVARK at 0.29. On TNT, THE LAST SHIP returned from a rerun week at 0.58, and MURDER IN THE FIRST was at 0.17. On Showtime, RAY DONOVAN lost 0.03 to 0.33, and ROADIES held at 0.10. USA’s MOTIVE rose 0.06 to 0.20. TV Land’s THE JIM GAFFIGAN SHOW dropped 0.02 to 0.11. 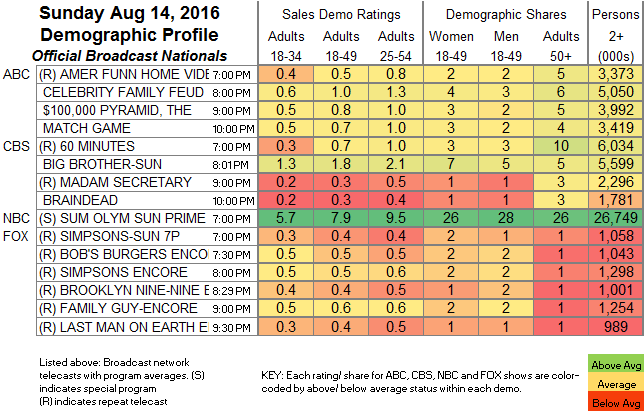 CMT’s STILL THE KING aired 2 season finale episodes at 0.07/0.05, compared to 0.06 for last week’s episode. The unscripted realm was led by NBC Sport Net’s afternoon RIO SUMMER OLYMPICS coverage at 0.67, with primetime at 0.35, and with Golf Channel at 0.34, USA at 0.22, MSNBC at 0.18, Bravo at 0.17, and CNBC at 0.12. 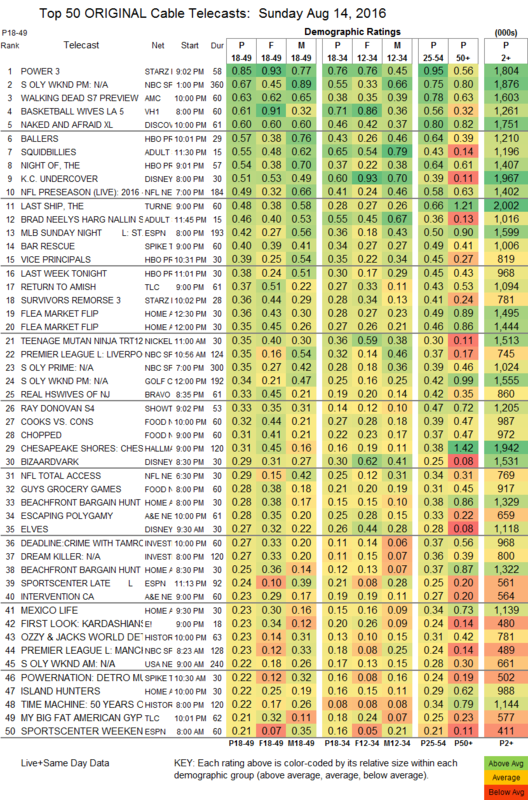 VH1’s BASKETBALL WIVES was up 0.05 to 0.61. DIscover’s NAKED & AFRAID ticked down to 0.60. NFL Network’s NFL PRESEASON Houston vs. San Francisco game was at 0.49. Spike’s BAR RESCUE gained 0.05 to 0.40. TLC’s RETURN TO AMISH jumped 0.12 to 0.37, and MY BIG FAT AMERICAN GYPSY WEDDING ticked down to 0.21. Bravo’s REAL HOUSEWIVES OF NEW JERSEY was at 0.33. On Food Network, COOKS VS CONS ticked up to 0.32, CHOPPED fell 0.04 to 0.31, and GUY’S GROCERY GAMES added 0.05 to 0.28. On A&E, ESCAPING POLYGAMY dropped 0.03 to 0.28, and INTERVENTION fell 0.05 to 0.23. History’s OZZY & JACK’S WORLD DETOUR dropped 0.05 to 0.23.